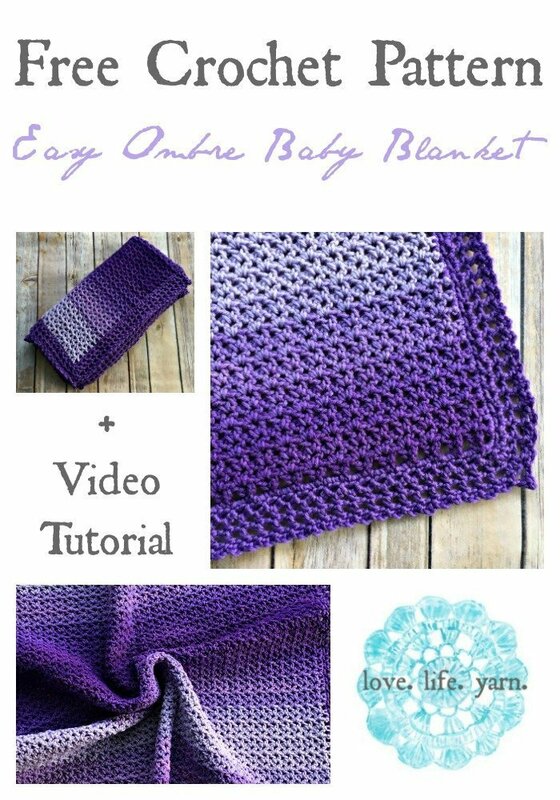 Easy Ombre Baby Blanket - Free Crochet Pattern - love. life. yarn. A few weeks ago I received a package from Red Heart yarns and one of the skeins inside was this beautiful violet skein of Super Saver Ombre. It took me a while to decide what to make with it and I finally decided upon a baby blanket. It’s been a while since I designed a blanket and the color changes of this yarn made a blanket an easy choice. 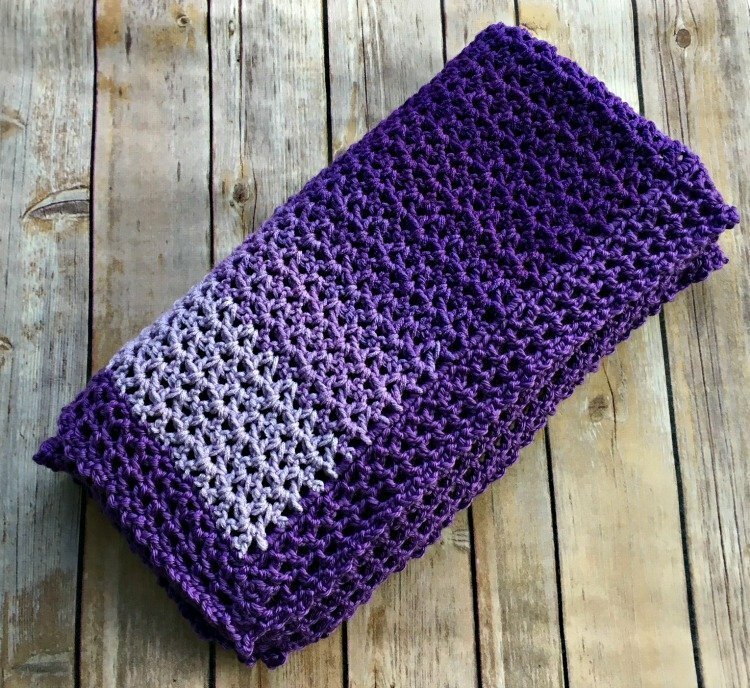 This has been one of those great projects that I can work on while watching tv or riding in the car because you repeat the same row over and over for the body of the blanket. A few times I just kept it in the car so when my husband was driving I could work on it! I do that pretty often – anyone else have a car project? While I’m thinking of fall and winter projects I hope you enjoy this free crochet pattern! Repeat row 2 until you run out of yarn. I wanted it as long as possible so I just used the whole skein without worrying about row counts. Round 1: Join CC. Sc evenly around, working 3 sc in each corner; join with a slip st in first sc. Round 2: Ch 3, [skip next sc, slip st in next sc, *ch 3, skip next sc, slip st in next sc; repeat from * to corner, ch 3, slip st in same corner st, ch 3]; repeat for each side of blanket. Round 3: Slip st in first ch-3 space, ch 4 (counts as dc, ch-1), *dc in next ch-3 space, ch 1; repeat from * to corner, work 3 dc in corner ch-3 space, repeat for each side of blanket, ending with a slip st in 3rd ch of turning ch. Round 4: Ch 4 (counts as dc, ch-1), *dc in next dc, ch 1; repeat from * to corner, work 3 dc in corner st, repeat for each side of blanket, ending with a slip st in 3rd ch of turning ch. Round 5: Ch 3, *slip st in next dc, ch 3; repeat from * to corner, ch 3, slip st in first dc of corner, ch 5, slip st in 3rd ch from hook, ch 2, skip next dc, slip st in next dc, repeat for each side of blanket, ending with slip st in first st.
That’s it! 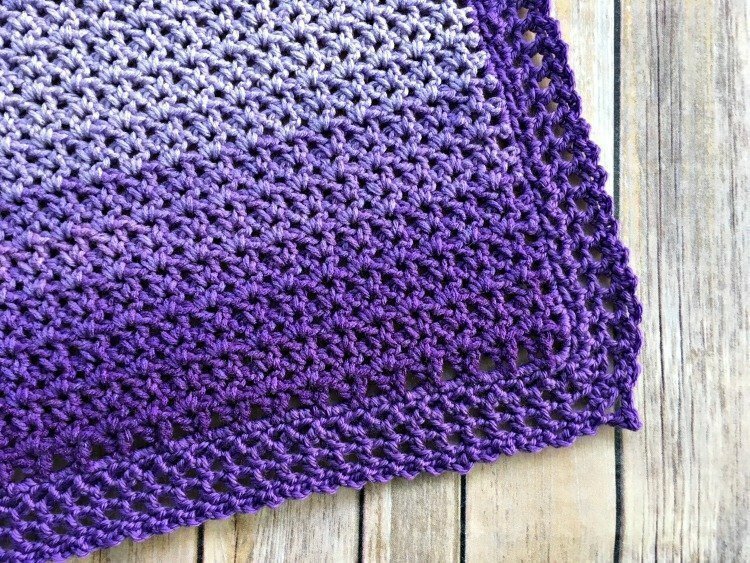 I hope you’ve enjoyed this free pattern – be sure to check out my other blanket and baby patterns, too. The afghan is lovely! What multiples did you use? I would like to make a full size throw. Hi Mary! This stitch pattern is a multiple of 3 sts + 4. Happy crocheting! I’m new so I want to make sure I understand. The pattern calls for 104 to start but the multiple is 3 +4. Should it be 103? I had to go back and sketch this out to make sure I had the number right just to make sure. The stitch pattern does call for a multiple of 3 + 4 but that doesn’t seem to allow for the last chain to have a dc in it. When I sketched it out (what I do when I need to double check my math!) the 104 still made it work even though the stitch pattern multiple is off by 1. If all else fails, you can always pick out the extra chain when you are done. 🙂 Great question! Thank you! Beautiful blanket. Hope mine turns out as lovely! This is absolutely beautiful. Thank you for sharing. 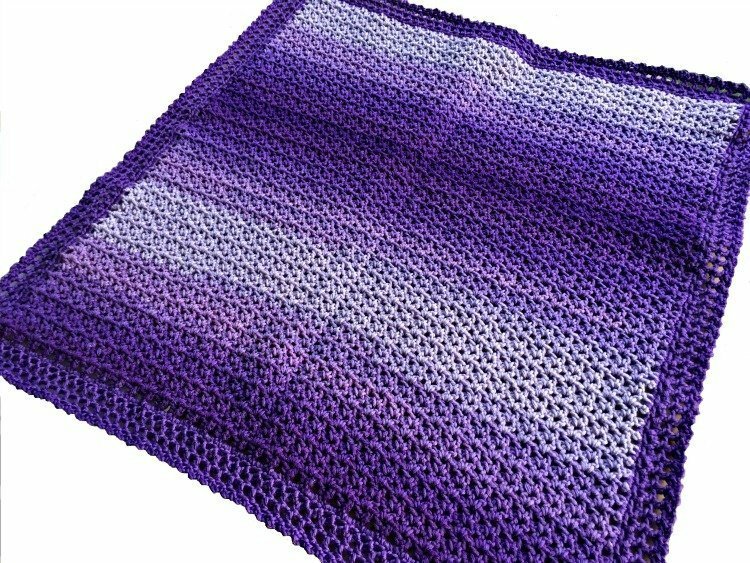 This is such a pretty color blanket, I make baby blankets all the time to just relax. I am also trying to learn how to work on understanding how to read a pattern better am excited about trying this. Thanks for pattern. I forgot to ask you how many skeins would I need to make a 45″ wide x 50″ long afghan? It is Beautiful. Thank you for the pattern. Right now I’m on my fourth blanket for my grandkids there is 6 of them LOL, I’m in the middle of a dinosaur blanket right now. My car projects are usually dishcloths. Love the afghan. What row did you add the violet and the lavender? or does it matter were you add it? 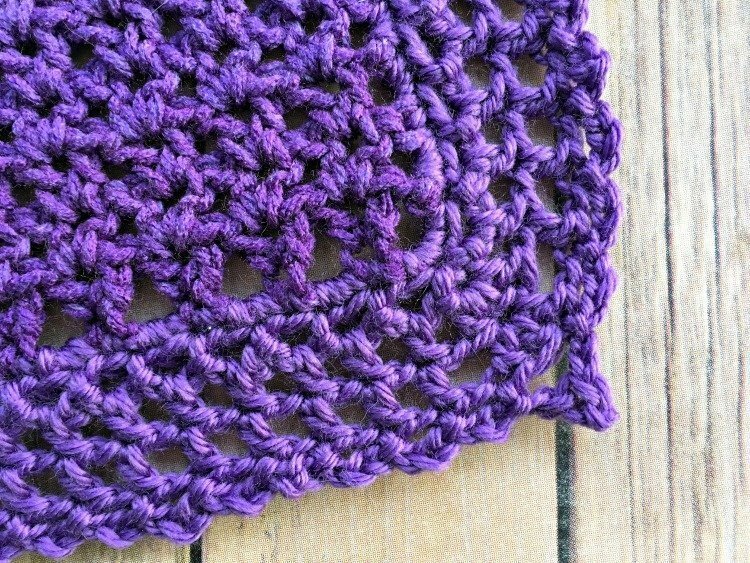 I didn’t add any lavender or violet – I just used one skein of Super Saver Ombré yarn that changes colors for you. 🙂 The only other yarn I used was for the border. Thank you for the pattern. I have 9 Grandchildern and I want to make a baby blanket for each one of them to put away for there first baby! Amanda thank you so much for this pattern. I’ve been looking for a pattern for a pillow and came across this one. I did add an extra step to make it as closed up as possible but if it wasn’t for your basic stitch I wouldn’t of thought of how to crochet this pillow. Thank you ! How many skeins would I need for an Afghan and will the color change look like yours? How many skeins you need would depend on what size afghan you are making. This project was just one skein. The color changes are totally the work of the yarn! This yarn is great for that because it has all the variations of the color without having to change yarns and weave in more ends. You can check it out here at the Red Heart website – and they have a great sale (20% off!) through October 2! Love that baby blanket !!! Purple/Lavender are my favorite colors ! Plan to make a larger version of the blanket. I have completed the main body of this baby blanket and am doing the edging. I am having trouble with the second and third row. I completed row two which I think is incorrect as it gathers the blanket and then I can’t do row three. Could you please calcify these two rows for me as I’m stuck and can’ complete this blanket. Thank you. Row 2 should not gather the blanket. You are working into every other sc with a ch-3 space in between and then row 3 is a dc, ch-1 pattern. Thank you for responding. I finally figured it out and the blanket is now finished. Nice pattern. As I am having a difficult time getting an answer could you possibly help me? I want to try the Ombre baby blanket and enlarge it to a small lapgan. I do not know where to start. If the ratio is 3 plus 4 would that mean take the original 104 stitches and multiply 3 plush 4? Louise – it depends on the size you would like to make. This pattern has a gauge of 4 sts per inch. So if you are wanting to enlarge it to 50″ wide you would have to multiply 50 inches x 4 sts per inch = 200 sts. You just have to make sure that whatever number you decide on can be multiplied by 3 and add 4 more to it for the turning chain. Then you can work the length to whatever you like. I thought I figured it out but didn’t. I would like the blanket to be 36 inches wide, How many stitches would I need to chain for that. Because 29 inches times 4 equals 116 plus 4 equals 120 chains not 104 so I am confused…..
Louise you are forgetting that the border adds some inches to the finished measurement. The last 4 sts are a turning chain and don’t count for the blanket dimensions, so that leaves me with 100 sts. 100/4 is 25 then the extra inches come from the border. Would you work up the number of stitches /rows to make a small lapgan? When I do the 2nd row for the boarder my blanket it starts to pucker. Did I do the 1st row wrong? That usually means the first row doesn’t have enough single crochets. Try adding more and see if that helps. I am so confused according to the instructions for row 2. Sc in every other sc with ch 3 sl ch 3 in corner where does the other ch 3 come in. I’m sorry if was supposed to say Slip Stitch in every other sc. to corner. Can someone please explain row 2 for me so i can finish my blanket. Sorry it has taken me a few days to get back to you – I’ve had a few late nights at work and a sick kiddo at home. You are working a ch-3 and skipping every other single crochet. For the corner you will slip st into the corner st, ch 3, and slip st in the same st to turn to the next side, then continue with a slip st, ch-3 in every other single crochet.